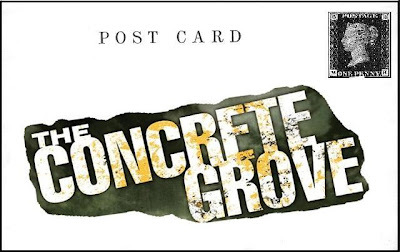 The Solaris Editors' Blog: Gary McMahon's "Postcards from The Concrete Grove"
Gary McMahon's "Postcards from The Concrete Grove"
Trinity Square was a shopping centre in Gateshead Tyne & Wear. Along with the concrete multi-storey car park, this formed an iconic Brutalist town centre which is as much revered as it is ridiculed. At the time of its design in 1962 by Owen Luder, the project was regarded as cutting edge. But even as it was unveiled to the public in 1967, interest in the Brutalist movement had begun to dry up and the car park was already looking like somebody’s idea of a cruel joke. The raw concrete weathered badly, the construction was beset by subsidence problems, and a rooftop café was built that never found a tenant and thus remained empty for the entire lifetime of the building. In 2010 the car park was finally demolished. The car park is most famous, of course, for appearing in the film Get Carter (Mike Hodges, 1971). Even then, the building was looking decidedly shabby. 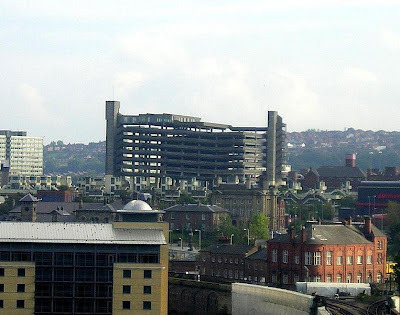 Although a multi-storey car park doesn’t actually feature in the Concrete Grove, this hard, harsh structure greatly influenced the feel and tone of the books. One insightful reviewer called The Concrete Grove a Brutalist horror story, which makes me believe that at least some of what I intended made it into the book. Many years ago I used to work for Gateshead Metropolitan Council. One of the tasks I carried out during my time there was a detailed survey of the car park. The top floor was due to be demolished and a colleague and I spent two or three days doing a crack survey – noting and logging all visible structural defects. We met the caretaker, who sat all day in a tiny concrete office on the ground floor of the car park. He made us tea, told us ghost stories, and talked about football. It was a good, strange time, and even then I knew that one day I’d use at least some of the experience in a story. I recall wandering the upper floors of the car park, feeling cut off from the world, and even in broad daylight there was a strange, creepy atmosphere. A heavy silence seemed to be held within the oppressive concrete walls, and wherever we walked it felt like someone was following us, watching over us. We did not walk there alone.